Good Food-Good Friends – Food News – Recipes – Food Facts – Sharing all about food. fresh celery that amounts to when celery is on the menu? the wad, the better, eh? cheese, peanut butter and uh, what else can we think of folks? the time to stuff it, I feel like de-stringing is a also a must. We "stuff" when company is coming, mostly. a dish from a recipe. prepare for your family or friends. Fifth, chop celery to freeze for later use in your own recipes. the water in the cells to expand and turn it quite soft upon thawing. 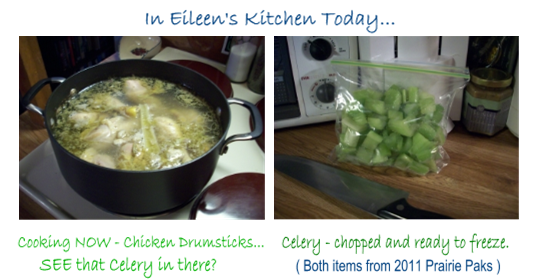 Use frozen celery for soups, casseroles, sauces and stock only. still be good to cook with. Eat it raw with a little salt, chop it and freeze it too! with no more thought than if she was talking to herself. and winter staple in kitchens everywhere. Oops! Almost forgot this! form is very handy, as it may take less to garner more flavor. for more than just jerky tho'. Chicken drums cooking with celery and chopped celery to freeze. 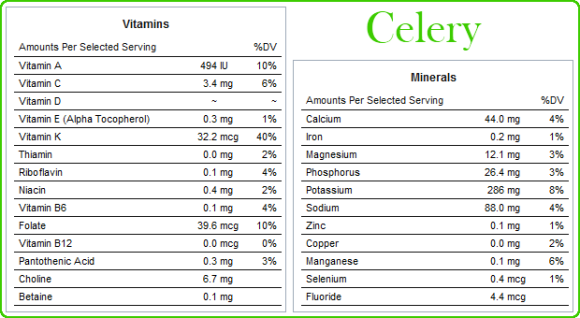 Celery is low in Saturated Fat, and very low in Cholesterol. Fiber, Vitamin A, Vitamin C, Vitamin K, Folate, Potassium and Manganese. Celery - Good for ya' too, eh? Food Discount Food Packages Program. Whew, that can be a mouthful. You know, when I was young (a long time ago) I dieted some. At that time I thought celery was a part of the ‘cardboard’ family of foods. Not much PA-ZAZZ. As I’ve aged, I’ve learned that the goodness of many foods lies in what’s hidden within and not what you dip it in!